Bulk Head Fittings available in 2" ,3", 4" and 6". Recessed Lids and Bolt Holes. 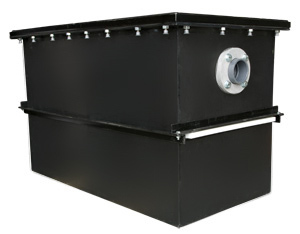 The Ashland APGI Series Interceptor is designed to separate grease, oils, fats, solids, lint and other sediment from large Commercial and Industrial sources. Made of High Density Polyethylene (HDPE), the APGI series interceptor is lightweight, cost efficient, extremely durable and corrosion free. Non skid 3/4" High Density Polyethylene are standard, all units are available with steel non-skid tread plates. Recessed lift handles are standard on all units. The HDPE construction is acid resistant and solids do not easily adhere to the smooth walls, making cleaning effortless. PVC glued connections are standard. Special sizes available to fit through narrow passages or existing walkways. Special units also available to meet larger capacities, including systems that utilize series and/or parallel interceptors. Straight through, left, and right hand models available. Most units ship in 4-5 days.